Where Do Nurse Executives Work? The nurse executive plays a pivotal role in medical care as they help carry out the mission of their healthcare organization. A nurse executive often holds the most senior nursing position in their place of employment, and can even hold a title such as Director of Nursing. 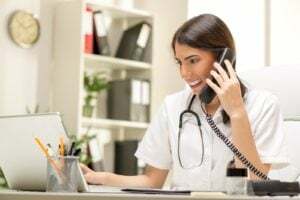 In order to be an effective nurse executive, RNs must clearly and effectively communicate with their nursing staff to help provide the best patient care possible. Not only do nurse executives assume social responsibility for instilling change to improve the health of patients, families, and communities as a whole; but they also practice moral and ethical principles while doing so. Nurse executives are considered to be very valuable members in healthcare management. A mix of high-level nursing knowledge combined with savvy business skills are required to become a successful nurse executive. Typically, a high level nursing degree and even a business degree are needed to enter the role, along with a substantial amount of nursing experience. To be suited for this high-level position, nurses must have a passion for leadership, excellent interpersonal and communication skills, and have a knack for the business side of healthcare. What Are the Education Requirements for Nurse Executives? One must then obtain their Master of Science in Nursing (MSN) or a Master's in Healthcare or Business Administration (MHA/MBA). The program generally takes two years to complete. See our list of MSN in Executive Nurse Leadership programs. As a nurse executive manages and oversees an entire nursing staff in a healthcare environment, he or she must have advanced certification. While some degree programs may simultaneously prepare students for these certification exams, it is important to meet all accreditation standards as there are a few exceptions. For instance, if one does not pursue a master's degree, 30 hours of continuing education credits will be required. As credentials make a world of difference to one's resume when applying for nurse executive roles, the more credentials one has, the greater the employment opportunities. The American Nurses Credential Center (ANCC) offers two exams: The Nurse Executive and Nurse Executive-Advanced exams. In addition to the ANCC, the American Organization of Nurse Executives (AONE) provide certification credentials that include Certified in Executive Nursing Practice (CENP) and Certified Nurse Manager and Leader (CNML). A professional nurse executive will need to possess leadership qualities as they must share ideas and effectively mentor their team. As this field is fast-paced and generally behind-the-scenes, one must be comfortable in assuming a managerial role. Nurse executives promote creativity within a nursing team, demonstrate financial responsibility, provide continuing education courses, and encourage the staff to join national nursing organizations. The roles of nurse executives have expanded from simply focusing on nursing services to a broader overview of patient care in a healthcare system. What Are the Roles and Duties of a Nurse Executive? With healthcare constantly evolving and changing, nurse executives must raise awareness and constantly seek new ways to provide services not only for today but for the foreseeable future. With this in mind, the duties of a professional nurse executive will only continue to expand as these nurses assume responsibility for instilling change in healthcare organizations. By being flexible yet innovative, nurse executives must continue to learn how to grow in order to truly succeed at their job. With advanced nursing jobs increasingly in demand, the overall employment for this type of role remains high. Certified nurse executives can earn an annual salary of anywhere from $70,000 to well over $100,000. Location, place of employment, education level, experience, and many other factors will determine the exact salary.